I don’t think there’s any story more fitting for Veteran’s Day 2014 than that of First Lieutenant Alonzo H. Cushing. Last week, President Obama finally bestowed upon 1LT Cushing the Medal of Honor for his actions at the Angle during Pickett’s Charge, 151 years, 4 months, and 3 days earlier. It is the longest wait for a Medal of Honor in history, and required a special act of Congress to make it happen. I’d like to try to explain in this post why this honor is so well-deserved. 1LT Alonzo H. Cushing. Photo from Wikipedia. Cushing was born in Delafield, WI, January 19, 1841. When he was just 6 years old, his father died, prompting his mother to move him and his siblings to Fredonia, NY to be closer to other members of the Cushing family. 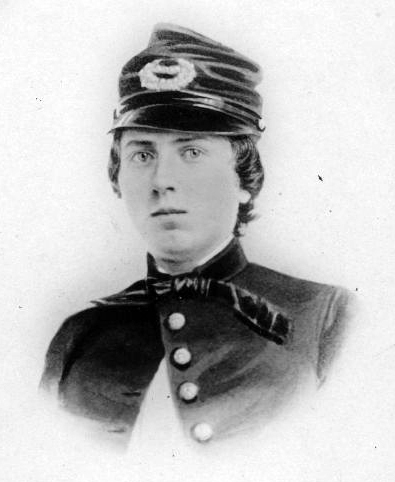 In 1857, he began his military career at the United States Military Academy, but he was not able to finish all his studies because of the outbreak of the Civil War in April of 1861 (in those days, West Point had a 5-year curriculum). That year, the senior class was graduated early (in order to provide a core group of young officers to the newly-expanding army) and the juniors were given accelerated military training, graduating in June of 1861. These dual classes of 1861 have caused numerous headaches for Civil War historians ever since. Cushing was part of that second, June 1861 graduating class. He was given a commission in the artillery, and by all accounts, was a fantastic “up-and-coming” artillery officer. He was given honorary promotions (called “brevets“) on three separate occasions, eventually ending up with a brevet rank of Lt. Colonel. The problem with the artillery is that it was a fairly small branch in terms of personnel, so there were not a lot of opportunities for actual advancement. At the Battle of Gettysburg, for example, there were 120 generals present between the two armies. Only two of those generals (one on each side) was an artillery general. The place for people who wanted to get promoted was the infantry. So as good as he was, Cushing was stuck as a lowly lieutenant. By the time of the Chancellorsville campaign in May of 1863, Cushing had been given a command of his own – Battery A of the 4th US Artillery – consisting of six 3-inch Ordnance Rifles. He remained in command of the unit during the Gettysburg campaign, and it was during that time that he was given the brevet promotion to Lt. Colonel by Maj. General Hancock on July 1, 1863 – not on July 3 as is widely assumed. We’re not sure exactly what he did to earn that honor, but obviously it was impressive enough to warrant the praise of a corps commander. The best guess is that he helped coordinate the defense of the Cemetery Hill / Culp’s Hill line that evening. Of course the action that he is famous for (and that led to his Medal of Honor) occurred on July 3, 1863 during the climax of the Battle of Gettysburg, best known as Pickett’s Charge. 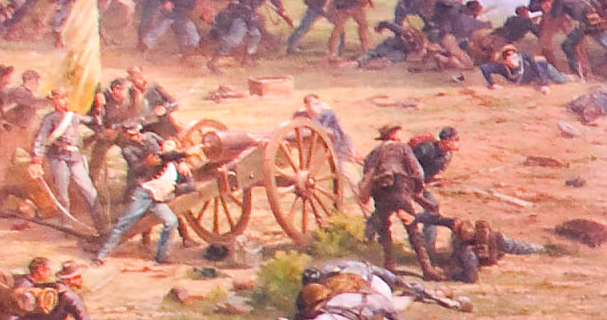 Prior to Pickett’s infantry assault, a massive artillery barrage was planned by the Confederates with the goal of softening the Union defenses at a specific point where there was a small copse of trees. All the Confederate guns concentrated their fire on that easily-recognized target. Cushing’s Battery A, 4th US Artillery was positioned right at that spot and as a result, took a pounding for several hours that morning. By the end of the day, the unit had lost 1/3 of it’s men. Cushing himself was wounded by a shell fragment that blew through his right shoulder. Despite the painful wound, he refused to leave his post to get medical attention. It wasn’t long before another piece of shrapnel tore across his abdomen and groin, and the young 1LT was said to have been holding his own intestines in with his hand. At that point, he must have known that there was nothing that the medicine of the day could do for him – he was probably going to die from that wound. Cushing in the Gettysburg Cyclorama. Note his left hand clutching his abdomen. Painting from Wikipedia. In the face of all of this, he stayed with his guns – vowing to fight it out or die trying. As he lost more and more blood, he became too weak to effectively give orders in the chaotic noise of the battle, or even to stand on his own. His First Sergeant, Frederick Fuger (who would earn his own Medal of Honor that day) held him up and relayed his orders to the men. As the Confederates approached the stone wall at the Angle, Cushing ordered that his last two working guns be moved forward to the wall. As he was giving the order to fire a double load of canister at the Confederates, a bullet entered his open mouth and went out the back of his head, killing him instantly. He was just 22 years old. Obviously, 1LT Cushing performed his duties with great bravery and devotion at Gettysburg, and other men around him – including Sgt. Fuger and the infantry commander at the Angle, Brig. General Alexander Webb – were given Medals of Honor for their part in the defense of Cemetery Ridge that day. So why has Cushing been left out in the cold for over a century and a half? There are two main reasons for this, I think. At the outset, officers were not eligible to receive the Medal of Honor. Although this was quickly changed, not many officers were given the award early on. Just as one example, the first Medals of Honor for actions at Gettysburg were awarded in 1864 – before the war was even over – but the first officer from the battle to receive the honor wasn’t until 1869 (with most of those coming much later in the 1890s). Second – and this is quite shocking to us today – the Medal of Honor was generally not given posthumously in the early days. Odd as it sounds, if Cushing had survived the battle, he had a much better chance of immediate recognition. Combined with the fact that as a young, fresh-out-of West Point officer, he had not been married, and had no children. So by the time that Medals of Honor for Civil War officers had become more common, there was no one left to fight for him. His story faded into the background, known mostly just to Gettysburg buffs and tour guides. Thanks largely to the efforts of Margaret Zerwekh, a local historian from Delafield, WI, who started a letter-writing campaign to members of Congress over 40 years ago, 1LT Cushing has, at long last, been given recognition commensurate with his service. The President of the United States of America, authorized by Act of Congress, March 3rd, 1863, has awarded in the name of Congress the Medal of Honor to First Lieutenant Alonzo H. Cushing, United States Army. First Lieutenant Alonzo H. Cushing distinguished himself by acts of bravery above and beyond the call of duty while serving as an artillery commander in Battery A, 4th U.S. Artillery, Army of the Potomac at Gettysburg, Pennsylvania on July 3rd, 1863 during the American Civil War.